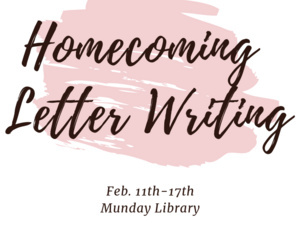 Join us at the Munday Library for Homecoming Letter writing! Come to the front of the Library where you can use different colors and crafts to construct letters that will be placed in a Homecoming time capsule. Celebrate and preserve your experiences at the Hilltop through this week-long event.